All About Sports Cards: Topps is just past the half way point of revealing the 60 greatest baseball cards of all time. Topps is just past the half way point of revealing the 60 greatest baseball cards of all time. 2011 will be the 60th year Topps has issued Baseball Cards, their diamond anniversary. In celebration, Topps has a lot of promotions associated with diamonds and the number 60. Ten people are going to get a chance at winning one diamond engagement ring valued at $10,000 for Valentine's Day. Check out this funny video explaining it all. As we mentioned back in Novemeber, another promotion that Topps is running is a fan vote for the "Topps 60 Greatest Cards of all Time!" The polls on that one are closed and they are now revealing the cards. They are at the half way point and the cards have been impressive. 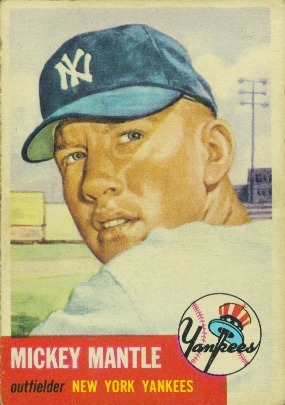 Card number 30 was the Topps 1953 Mickey Mantle. 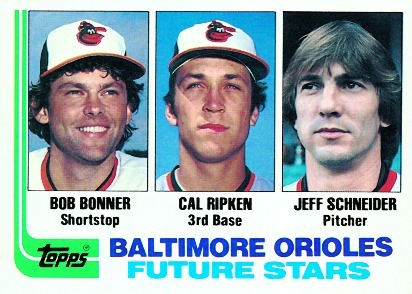 The most recent was card number 28, the 1982 future stars card for the Baltimore Orioles. You didn't have to be The Amazing Kreskin to see the potential of that guy in the middle. I have a few of those Cal Ripkin Jr. rookie cards. Topps will continue to count down the 60 cards which will lead right to the release of their baseball cards. To see the countdown, go to the Topps site using this link.